….where science, art & magic meet. About Me: I am an Educator, Counselor, Mystic, Astrologer and Healer. I offer private sessions and teach the Mystic Card Cosmology Method, Vedic Medical Astrology, Healing Arts, Yoga and Massage Therapy. As an international instructor and presenter in the field of metaphysics and healing for over 25 years, I’ve been interviewed on Fox TV, published many E-books and articles, developed seven instructional healing arts videos and online courses, founded and operated the first private proprietary state approved massage school in RI for five years and am still the owner and founder of Sacred Stone Academy for Metaphysics and Ayurveda (S.AM.A.) As the inventor of hot stone massage in 1999 and licensed massage therapist, I also have experience as a Shamanic and Ayurvedic Practitioner and a nationally certified yoga and dance instructor and performer. After I became initiated as a Siddha in the Transcendental Meditation Movement in 2008 Iowa, I earned my masters degree in holistic medicine from Goddard College in 2013. I have been a student of Vedic Astrology and the Mystic Card Method for 18 years, while simultaneously seeing clients for readings, health consultations, healings, massage and instruction. My book on the Mystic Card Method will be published in 2020. I counsel from the heart and create a sacred space for clients to heal in body, mind and spirit. As a gifted listener and a natural-born intuitive, my optimistic perspective will shine the light on the “good news” in your life. I will not share anything negative unless you ask and only if I feel it would be beneficial to know. I will compassionately explain what I “see” and “hear” in your life chart without judgment and will meet you where you are “at” on the soul level. When I am not in service to my beloved students and clients, I frolic in the ocean almost every warm day, dance in Zumba classes, laugh with my daughter and play in my kitchen creating sumptuous, holistic meals and treats. After many years of victoriously battling many genetic autoimmune diseases, using food as medicine, I am finally living a life of balance and health in Newport, RI with my 30 year-old daughter who is also successful and passionate in the healing arts. 401-680-3934. I’m available by phone, zoom.us and in-person. Book an appointment with me here. “Oh, the wonderful knowledge to be found in the stars. Even the smallest things are written there…if you had but the skill to read.” - Ben Franklin. “The greatest minds in history understood the secrets of mathematics.”- Albert Einstein. First webinar or class is free for the first 11 students to email me. Intro to Mystic Card Cosmology Webinar begins Tuesday April 23, 2019 from 7p-9p Eastern Time for 4 consecutive Tuesday nights. Exact Dates: April 23, April 30th, May 7th & May 14, 2019. Level 1 Mystic Card Cosmology Webinar begins Sunday August 4, 2019 from 7p-9p Eastern Time for 4 consecutive Sunday nights. Exact Dates: Aug 4th, 11th, 18th, 25th, 2019. Prerequisite: Attended introductory level or listened to the recording. Tuition: Use this button to register for either intro or level 1. All Levels are $188 each. Level 1 Mystic Card Cosmology Dates to be announced. Email me so I can include you on my notification list when I determine the dates, as well as offer discounts and early bird specials. Rhode Island students can participate in the webinar for free and receive the recordings. 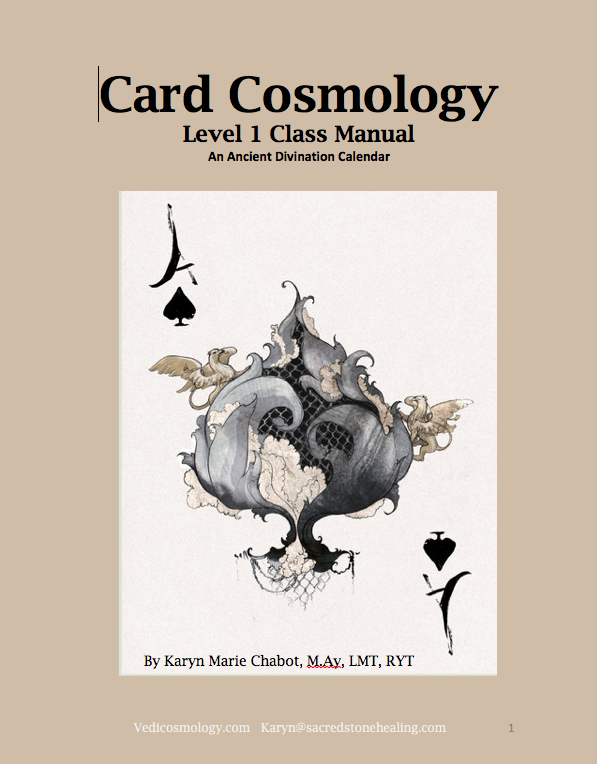 Earn Your Mystic Card Cosmology Certification After Passing Level 2. Stay tuned for Level 2 Class Dates. Tuition: Use this button to register for either Level 1 or 2 Webinar or Class. All Levels are $188 each. Send to The Yogic Mystic 26 Mumford Ave Newport, RI 02840 payable to Karyn Chabot. To meet the Early Bird parameters, your envelope should be post marked on or before the deadline date and tuition must be paid in full. Thank you! Required Online Book of Destiny 4.0 Software Initial registration is $19.00. After that, it’s a monthly fee: $9.95 at this link. Please note, the book is titled Love Cards and the software is titled Book of Destiny 4.0. Discontinue monthly payments whenever you wish. What To Bring: Smartphone, laptop or Ipod to view the cards on Robert Lee Camps Software for $9.95/month, along with a notebook, pen and deck of playing cards. Discover your families cards and any genetic or "karmic loops"
Prerequisites: Believing in the magic and wonder of life on earth. Gratitude. Passion. Open mind. Open heart. Please specify if you are signing up for the webinar modules or the Rhode Island classes, Level 1 or 2, and which dates listed above you would like to attend. What is your natal and ruling card? Click on the Free Mini Card Reading link at the top navigation bar to discover that. Explain any prior education with reading the cards. Why are you interested in taking this class? By clicking the submit button, I agree and understand that any and all information disclosed during the Zoom.us webinar will be considered public information because all webinars are recorded and will be available and sent to all participants upon request and others as a refresher or in case a student misses a session. This does not apply to student's studying 'live' in person where webinars are not involved. When a woman learns clairvoyant tools, her world changes. She no longer holds back. She keeps to her tide. She rises to her wishes. When a woman learns clairvoyant tools, her creativity is loud. She plays with her karma. She talks to her healing guides. She tends to her heart. She witnesses her darkness, until her light becomes unwavering. She grounds when she’s intimate. She gets out of her body with awareness. She calls herself back in with kindness. How long will it take her to recognize her beauty, to hear her inner voice, to meet herself? When she transforms, we all change. Our future comes through her. The original playing cards were actually once a stack of tiny, loose-leaf, unbound pages; perhaps papyrus, seaweed or banana leaves. The actual size of the “paper” was based on a precise, sacred geometrical size, later called a “deck” of cards. These cards are coded with archetypal shapes with hidden meanings that we now call suits. Each day of the year is assigned a specific natal and ruling card that gives rise to unique tendencies, patterns, and personalities. Based on one’s birthday (natal) card, we can depict its unique mathematical resonance, which can be used with cryptic formulas to calculate past, present, and future happenings in one’s life, as well as see the characteristics expressed in the layers of one’s personality. The suits, numbers and royal cards are cosmic images and symbols designed to expand consciousness, as well align with the human experience on earth. Some consider it to be “The Book of Time”. Though this is a concise science, it is also a mystical art form that magnifies intuition and harmonizes the concept of free will and prayer. The Sanskrit language has one word that describes such a theory: Vidya. Its translation is the merge of science, art and magic. 52 cards in a deck = 52 weeks of each year. 4 suits = 4 seasons. 12 months = 12 court cards. 13 annual lunar cycles = 13 cards within each suit. When we add up the solar values of all the cards, we get exactly 365 1/4; the same amount of days inside one year. The joker is involved with the 1/4. Coincidence? Not. The deck of cards was actually an oracle and sacred mystical calendar cognized by an enlightened, highly evolved civilization. Later it was hidden in plain site for centuries because it was under persecution due to it's accuracy and power, which posed a threat to egoist kings, churches and other governments. There is nothing evil, or “gypsy” about it unless the reader has evil intentions. I believe there are assigned angels of the light and gatekeepers of this sacred science who have protected it through the dark ages of persecution, awaiting the time when people would finally wake up to receive this oracle with the dignity and power it was designed to embody. Thankfully, the cards were kept alive under the guise of game playing like "go fish", bridge, poker, and so on. This tiny book has it's own symbolic language outlining and defining each of our personal blueprints, genetic coding, gifts, challenges, future options and potential life experiences based on personal and global consciousness and the magic of the moment. Each card we play and how we play that card, create the fabric of our future. Once we fully understand this tiny book as it relates to ourselves, we can begin to understand that life is "play". The great mystics from India refer to this as the “Lila” of life, a Sanskrit term meaning the playful relationship between the absolute field of all possibilities and the relative world. This concept gives rise to the two main card templates, which are time-space continuums and the foundation of this entire science: 1. Absolute Spirit Spread. 2. Relative Earth Spread. Both spreads contain all 52 cards in a specific order for a specific reason. Having awareness of these two templates, their order and how to interpret them, we can begin understand our relationships and ourselves, where we have been, our current situation and where we might be going. These spreads are simultaneously static and dynamic and express the genetic fabric of life as our soul’s blueprint. With this knowledge, one can transcend illusion and suffering, live in gratitude and play in the “Lila” of life with more bliss and peace of mind.